A nice hot summer day is what everyone dreams of during the winter months. Now that it is here you want to cool off. If you don’t have a pool your next option is going inside to sit in the air conditioner. Sometimes your AC doesn’t keep up with the heat and you are sweating indoors. Instead of lowering the temperature on your thermostat use these 10 simple tricks. 1. Windows – Keep windows closed during high heat, but when it starts to cool down open up your windows to get a nice breeze throughout your home. Make sure to install a screen on your windows to prevent any insects from entering your home. Newer windows also help to keep heat from entering your home. If your windows are old they might be bringing in unwanted heat and air from the outside. 2. Fans – Ceiling fans, box fans, mini fans you name it turn them on. 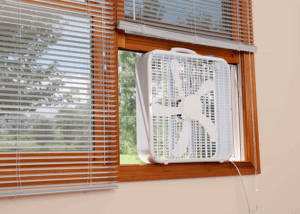 Putting a fan into your window at night will help to move cool air in and hot air out. Another nice tip to get a nice sea breeze is to put a tube of ice water in front of a fan so it moves the nice cool air when released from the ice. 3. Drapes/Curtains – Keep drapes and curtains closed during the day to reflect sunlight from entering your home. Invest in some black out curtains to help reflect sunlight and give you a good nights sleep with no outdoor night lights coming through. 4. Humidity – It is time to grill outside! Leave the oven, stove, showering, and laundry for later on in the day when its cooler outside. The heat and humidity from these will increase the temperature in your house. 5. Lights – Keep lights and electronics that you are not using off. This will also help on your electric bill. 6. Ventilation – Heat rises and if there is nowhere to escape it just stays put. Make sure your attic has proper ventilation for warm air to escape. 7. 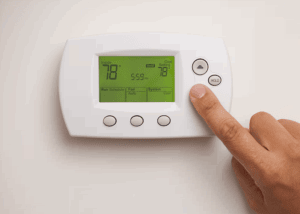 Thermostat – If you have a programmable thermostat it is best to keep a lower temperature when you are home and then increase the temperature when you are not. This will help save a little money on your bill. 8.Trees & Shrubs – Large trees can provide a lot of shade for your home. When planting new trees make sure to take note where the sun hits on the hottest days to create some natural shade around your home. 9. Insulation – Insulate your windows and walls to keep outside heat from entering your home. 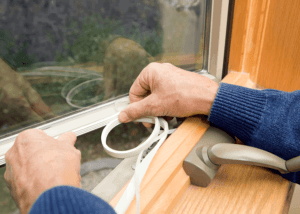 Make sure your weather seal on your windows are not cracked or eroding away. Replace them with never strips or even install them on your windows if you do not have any. 10. Close Off Rooms – Do you have rooms that you don’t use alot? 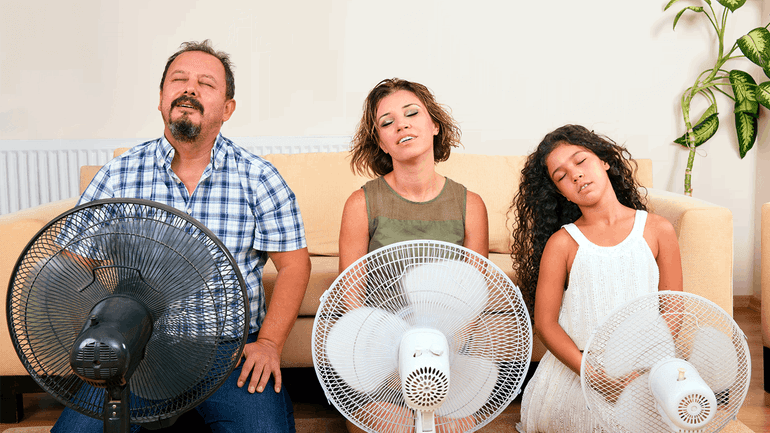 Closing them off when not in use will help cool your house faster.